View of the event at 10 p.m. on Feb 17 from mid-northern latitudes. The actual view varies by your specific location, however. Early last Christmas morning, for those living in parts of western and central Canada, the Pacific Northwest and parts of the Rockies and Plains States, a fat waning crescent Moon passed in front of the bluish 1st-magnitude star Spica, one of the brightest stars in the sky. Such an event is called an occultation (derived from the Latin word occultare, which means "to conceal. "), and it can be a startling spectacle, especially if the star happens to be bright. The star appears to creep up to the Moon's limb, hangs on the edge for a minute or two, and then, without warning, abruptly winks out. Later it pops back into view just as suddenly on the Moon's other side. Late on Friday evening, Feb. 17, the Moon will again occult Spica. But as was the case last Christmas, the region of visibility for this upcoming event will be rather limited. Over North America, only the Middle Atlantic and Northeastern United States and parts of southeastern Canada will have a chance to see this event, though in most cases, only the reappearance of Spica (from behind the dark limb of the Moon) will be readily visible. For many locales, the Moon will either be below the horizon when Spica vanishes behind the Moon's bright limb, or will lie very close to the east-southeast horizon, and likely dimmed by horizon haze. Farther to the north and east, from the Maritime Provinces of eastern Canada, both the disappearance and eventual reappearance of the star will occur with the Moon standing a bit higher above the horizon haze, making the occultation a bit easier to view. Also in good position to see this event are the Islands of Bermuda, 580 miles (930 kilometers) east of Cape Hatteras, North Carolina. Still, all prospective observers are advised to scout out where they intend to watch the occultation a night or two in advance, to make sure that there are no obstructions (like trees or buildings) between them and the rising Moon. The Moon rises about 62 minutes earlier on Feb. 16; 121 minutes earlier on Feb. 15. Here are selected the local times and the Moon's altitude for both Spica's disappearance and reappearance on Feb. 17, as well the local time of moonrise. For Halifax, Hamilton, and St. John's, the reappearance time is in Italics to indicate that that event is occurring Feb. 18. The action begins when Spica disappears behind the Moon's bright limb. This event will require at least binoculars or a small telescope, because glare from the Moon's sunlit edge will tend to hide the star. For those living in the New England States and eastern Canada, the Moon will be barely above the horizon, so poor seeing will compound the problem. In those cases where an altitude of zero-degrees is given, keep in mind that altitude info is provided in 1-degree increments and that the Moon itself appears ½-degree across. So it probably will be literally "sitting" on the horizon. 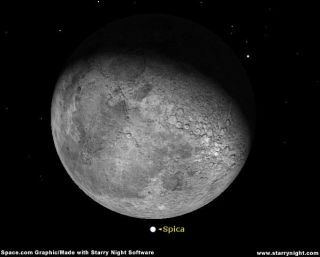 Spica will suddenly spring into view from behind the Moon's dark edge. If you imagine the Moon's disk as the face of a clock, most locations will see Spica reappear at roughly the one o'clock position. The star's sudden emergence should be able to be seen with the unaided eye if you have good vision, however the Moon's glare might hinder the visibility of Spica. So block as much of the Moon's sunlit portion as you can with a finger, a telephone pole or the edge of a building at least 20-feet away. Binoculars will pull the star in well, and a small telescope will afford a superb view. For rest of North America, Spica will be plainly visible hovering just above and a bit to the right of the Moon as they rise, the occultation having already occurred. As the night progresses, the Moon will pull away to the east (left) at its own apparent diameter each hour.